Partition walls and floors can be insulated to allow for extra privacy between rooms (and at the same time for better fire safety). By sound class, we mean the sound insulation (dB) that can be expected between the spaces where the separating structure is used. The laboratory recorded measurements of the construction solutions below are at least 3 dB below the stated values. Examples of how different activities can be heard at different dB (sound insulation values) between the rooms. By using a 20mm Mineral Wool board or Wood-fibre board (white) between 2 layers of OSB the sound through a timber floor can be reduced to half. 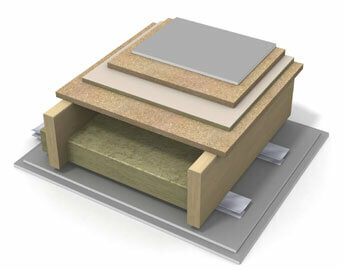 The Mineral wool slab (white) is placed on the construction floor, and another layer of board is placed cross wise on top of it. The double layer of plasterboard combined with the de coupling effect of the metal profiles reduces the sound through the roof by a further 10 dB.